The 1968 GT500 was the fastest Shelby car produced to date. Though factory rated at 335 horsepower, it was believed the true horsepower rating was between 435-500. The 428 Cobra Jet was introduced on April 1, 1968. 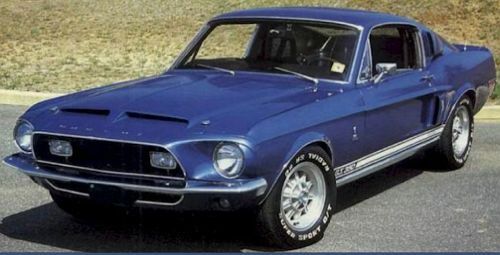 The original GT500 had a 4 speed and the engine was really being worked more because of the fewer gears and the lousy state of the art tires from 1968. The older Shelby was much cruder in the ride and handling, but it was far superior to the stock little 350 Mustang. The 1968 had major improvements in the chassis and suspension along with the 428 engine. It launched straight and true at 4500 RPM and it was wild. It was the epitome of the street racing machines of that day and time.